In the movie â€œThe Terminatorâ€, we see Arnold Schwarzenegger check out the complete profile of the subject he is about to face.Â A similar technology has been developed by Babak Parviz, an electrical engineer at the University of Washington. Babak designed a lens that can be used to display a single pixel at a time. This display can be switched on and turned off through a wireless medium. 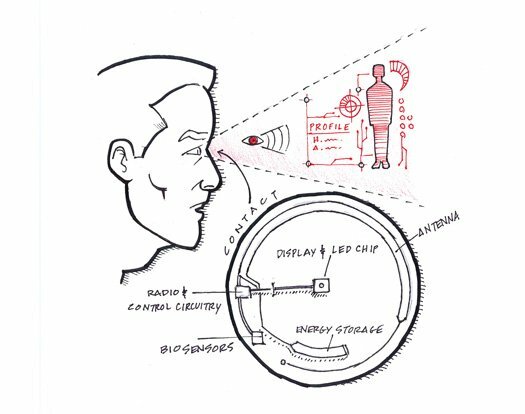 The lens consists of an IC which stores the energy, along with an LED that shoots the light towards the eyes. But, the lens is not capable of intercepting objects that are very close to the eye. This problem is overcome by placing some counter lenses in between the LED and the eye. The same principle can be simply tested by placing an appropriate magnifying glass to see your finger that is placed very near to your eye. Till now, the lens has only been designed to display one pixel. But, there may be a time when you could use the lenses to bring together all the displays you interact with on a daily basis â€“ your PC, fridge, chair, mobile â€“ into one personal display in your eye. Later, the same technology could be modified to bring in virtual images into the real world. For example, you could design the interior of your plain room with paintings, furniture and so on. As show in the figure above, the LED part of the lens is opaque, but these little dark spots shouldnâ€™t make the images unnoticed. A control circuit and a radio are also shown. They are used to gather the energy from a transmitter kept at the edge of the lens and convey the information to the outside. The design is made sleek enough in such a way that they do not block the view in any way. The lens was first tested on animals and they have proved to be working perfectly without any safety problems. The officials are waiting for an approval to test it on humans. If this technology does become famous, the researchers will have to take special care in protection of the software side. That is, someone could easily pop up spams inside the control circuitry of the lens and block the view of a person, who may be busy driving his car. Add/Replace RAM to your Laptop easily! though there’s no “Editing” for correctness. However, I see this a lot on most Internet sources, including the Media reports. Thanks for pointing out. I have edited all the errors I could find.